We fit every type of horse, and have particular expertise in fitting notoriously difficult horses such as Cobs, Dale ponies, Fell ponies, Welsh Section D etc. 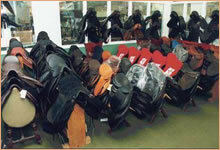 Although we are experts at fitting saddles personally, we do send saddles by mail order to clients who are unable to have us call for reasons of distance or geography, but we do require an accurate description of horse and rider, the purpose of which the saddle is to be used, and it is most helpful if we could have a wither template either e-mailed or faxed to us. or contact us, so that all your requirements can be thoroughly discussed. 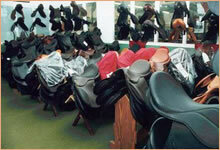 In addition to all the saddles illustrated we carry many more makes, sizes and types. Arabian horses are notoriously difficult when it comes to fitting saddles, quite simply, the AH is not like other horses. We are acknowledged experts in this field and will be happy to discuss your problems and requirements at any time. Ken Lyndon-Dykes is a regular contributor to articles in the Arabian Link magazine.